Obi-Wan: (speaking to Master Qui-Gon about Jar-Jar Binx) “Master, why do you keep dragging these pathetic life forms along with us when they are so little use? Qui-Gon: “He seems that way now, perhaps, but you must look deeper Obi-Wan. Now what I’m getting at with all this is to make the point that no matter where you are in this scenario you will always have those you think of as pathetic life forms, but at the same time you are a pathetic life form to someone else. 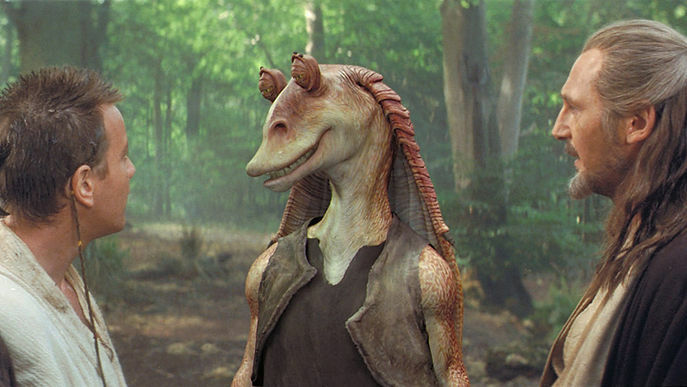 Now secondly, what do the Jedi say about these pathetic life forms? Obi-Wan is calling them a distraction, and describes them as being of little use. His Master corrects him to say that they are like a secret treasure. Hidden, for the time being, in this vast and pervasive Force that we are all a part of. Their purpose is sometimes hidden but can be sensed now though perhaps not revealed until later. Now that is true with the person you saw on the street that annoyed you too. Or the constantly irritating person in your life that you constantly look to the Universe and ask “Why?” Or to that person who posts online all the time and you just shake your head and think “Oh, what a pathetic life form.” But consider that same person is a hidden gem whose purpose may not be revealed until later. Also keep it in mind for yourself when you sense you have been placed on someone else’s “pathetic life form” list. Sometimes the people who don’t like something we are doing or just don’t generally like us are wrong. Sometimes they are right about something we need to improve. But either way, we are not diminished as we are all gems hidden in the Force with our purpose and perhaps part or all of our worthiness hidden for the time being in this vast and pervasive Force. —Written by a pathetic life form.